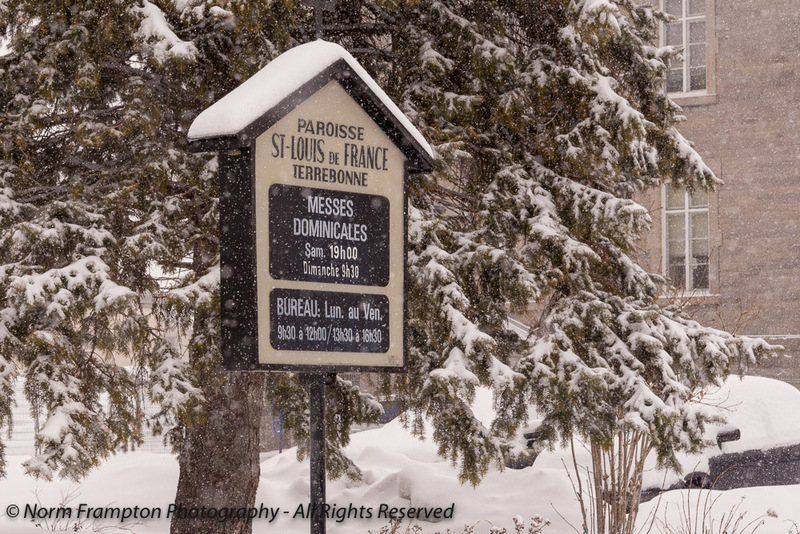 The Parish of Saint-Louis-de-France was initially established in 1723 in what is now Vieux Terrebonne. This puts it among the 35 oldest Parishes in New France. The original church was built in 1743 much closer to the Mille-Iles river about 600 yards down the hill from the current church’s location. By the mid 1860’s the congregation had outgrown the original building and plans were drawn up to build a much bigger church nearby. At the time Terrebonne was a relatively poor rural farming community. It took close to a dozen years to raise the funds for construction of the new church. A generous donation of land by a wealthy local benefactor also helped get the project moving forward. Designed by French Canadian architect Louis-Gustave Martin, the current structure was built between 1877 and 1879, and aside from a number of renovations and upgrades made over the years, it remains intact today. 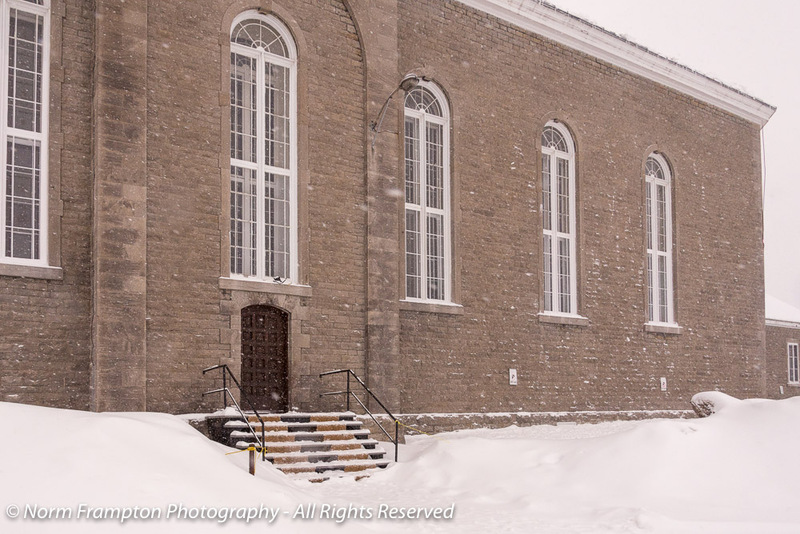 On a snowy afternoon a few weekends ago I took a walk around to explore its doors and see what else there was to discover about this beautiful structure. Don’t forget that if you share your blog posts on Twitter and Instagram, use the #ThursdayDoors hashtag to help others find you, and please do take a few minutes to visit some of the Thursday Doors posts shared by others. 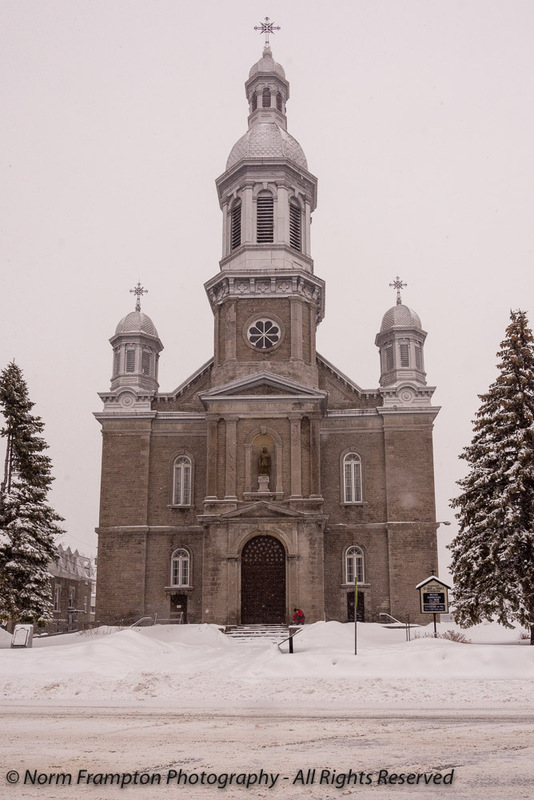 Gallery | This entry was posted in Photography, Thursday Doors and tagged Canada, Church, Doors, Eglise, Historic Buildings, Québec, Snow, Thursday Doors, Vieux Terrebonne, Winter. Bookmark the permalink. I realize the actual photos are of the “newer” version but seem to echo our 1700’s churches in New England, Norm. Beautiful! Oof! The beauty of that snow, Norm. 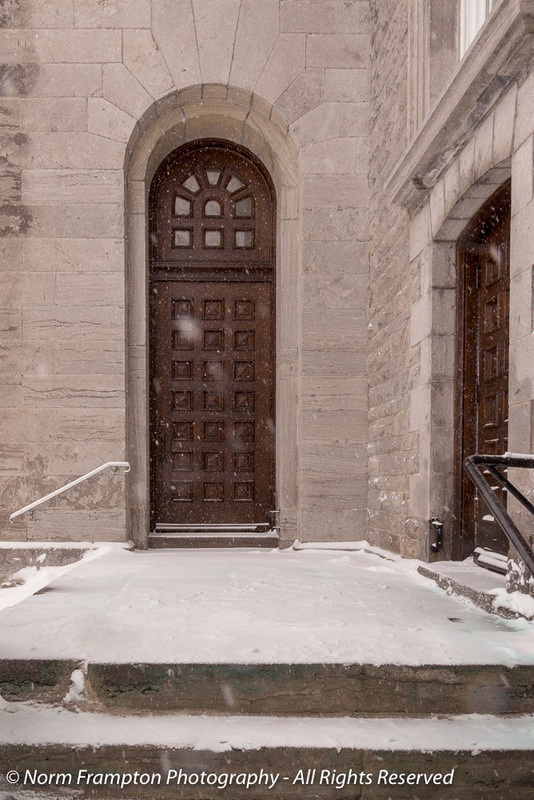 I mean, the doors are wonderful and the building is all the superlatives, but the snow really adds that layer of Ooh! for me. We’ve had a lot of rain lately and it seems so odd, because ordinarily that would have been five days of snow, here in February. Thanks Joey. We’ll see how it goes but I believe we may already be done with the snow here. We’ve had a lot of rain the last few days too and unseasonably warm temps causing snow melt. there are serious concerns about flooding in some areas too. Sorry to hear that. I hope nothing tragic comes of the melt. It’s been too warm to snow here for a while, but I know March, and it’s not over for us. No wonder it took so long to raise funds for it – that church is nothing short of grand! Amazing images and with blurred snow flakes for the authentic touch! Yes, it is a beautiful structure! It’s absolutely gorgeous! In the snow magical! I loved the person in red in the first image. It really lent a sense of scale to the building. It’s HUGE! I hope it draws a packed house for Mass. Beautiful pictures! At first I thought you added a nice sepia filter on your images, then I realized that that’s what winter and snow looks like. Who knew? (Well, I guess a lot of people knew). Just lovely. Yes indeed the snow sure does change the look of things. It has a cold melancholy about it. But so beautiful. Thank you. One thing you do notice about snowy days is how quiet the world becomes. The snow really does absorb the sound. It’s an eerie feeling at times. Yes, like beyond silence. Like the beyond stillness of death. Sorry if that sounds morbid. To me it is the ultimate reverence. You sure took many photos in that snow. I guess that’s what you do when there is no choice. Well done! Lord! It occurs to me lately what a wimp I am when it comes to hiking in the cold for doors. The confines of a heated vehicle are addictive. Especially with my creaky bones. lol My utmost respect to you Mr. Norm! I don’t deserve that much credit. It only seems impressive. I usually don’t go out unless it’s relatively mild. This day for example was only a few degrees below freezing. Very bearable if you dress for it. Beautiful captures Norm. 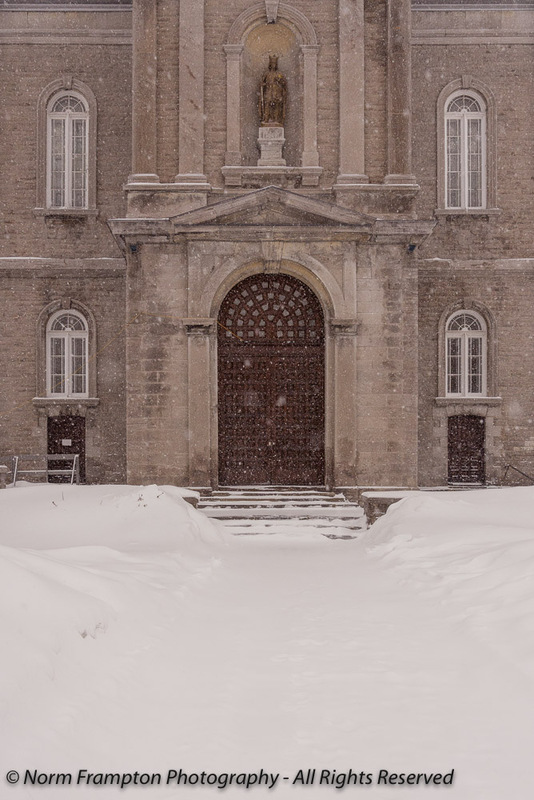 Like how the snow softens this old church. That the town came together to raise funds for the door, is a statement they valued this building. Makes me appreciate the doors even more! Thanks for taking time to visit it. Yeah, unless one likes the cold! I remember one of my studymates from PA would get depressed when the weather would turn hot. Beautiful pictures – are you using a tinted lens? Thanks Jan. No tinted lens. Perhaps what you’re seeing is the slight underexposure on these shots. Bright snowy scenes play havoc with a camera’s metering sensor. The camera usually sees a very bright scene and overcompensates by making it a bit too dark. I guess I didn’t brighten these up enough in processing. I always marvel at the craftsmanship in old churches. I knew so little about Canada before I joined this weekly challenge. What a wealth of architecture you have! This a beautiful church, wonderful doors and I’m trying to imagine how a poor farming community raised the funds. They must have had so much devotion to the church. Does religion play such a part in people’s lives now in Canada? Lovely post, thanks for taking us there, I’m glad it was you in the snow though! English Canada’s Protestant roots were always a little more low-key compared to the Catholics. Today both cultures are very much secular and not very devout at all. Most pay lip-service to the main traditions but are not actively practicing. The most devout people here now are newcomers, usually of non-Christian religions such as Islam, Sikhism, Orthodox Jews, Hindu. Their overt practices are very different from what most secular Christians are used to, and just like elsewhere, it can lead to some friction in society. Fabulous building, Norm. I like the way the fourth shot from the top shows how large those windows are, compared to the door. Nice big arched windows, the interior must be flooded with light. Thanks Jean. Yes I’ve seen a few interior pics online and you’re right, it’s fills up wonderfully with natural light. What a beautiful church and I love those doors. I feel my offering this week pales in comparison. Stunning building. It doesn’t look so ancient. It must have been modern when it was built. Thanks for the kind words Luccia. Well it’s only 140 years old so not ancient by any means. Plus it has a mix of various styles which makes it look more modern than say something done in the Gothic style. Big doors, little doors, all so different and all so alike. A beautiful building, with every detail coordinated with love. There is a flavour of Eastern Orthodox about those towers with their elaborate crosses. The new build looks more utilitarian, a bit like modern churches in France. Great pictures as usual. Thanks Ian. The design features an interesting mix of style but I agree regarding the crosses on the towers. Looks beautiful but cold. 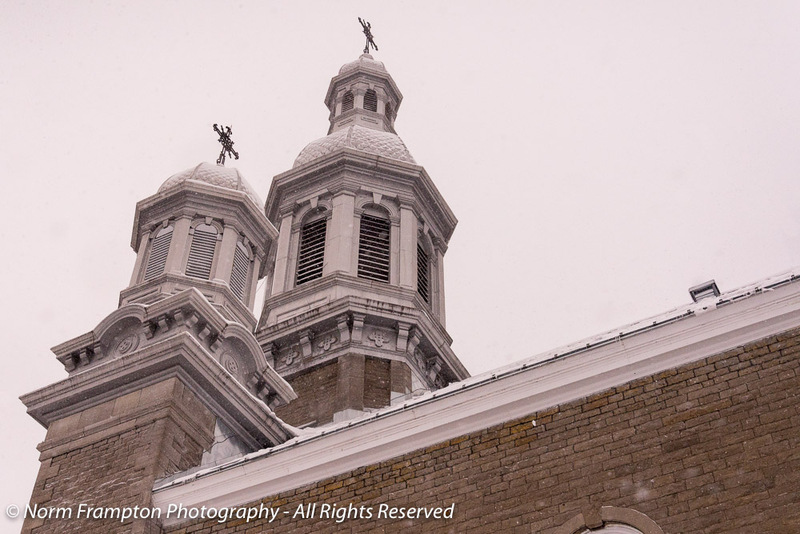 🙂 The snow really adds to the atmosphere in your photos, but the church is handsome enough to stand on its own. Beautiful photos. 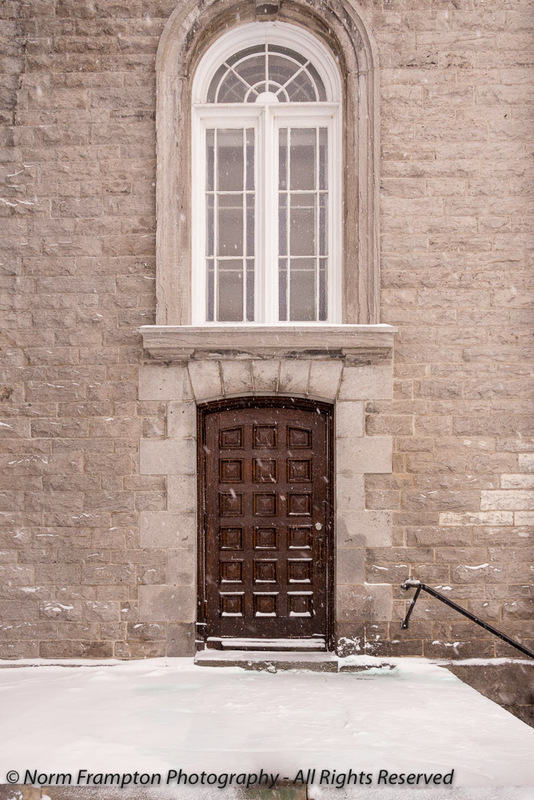 The snow + wooden doors make for a building that looks inviting. A building with a trio of cupola-like structures on top! Wonderful!! These are beautiful doors, Norm. I love the way the side doors mirror the main door, even in the arched transom window. All those panels! Just looking at them is making me tired, but such wonderful craftsmanship. 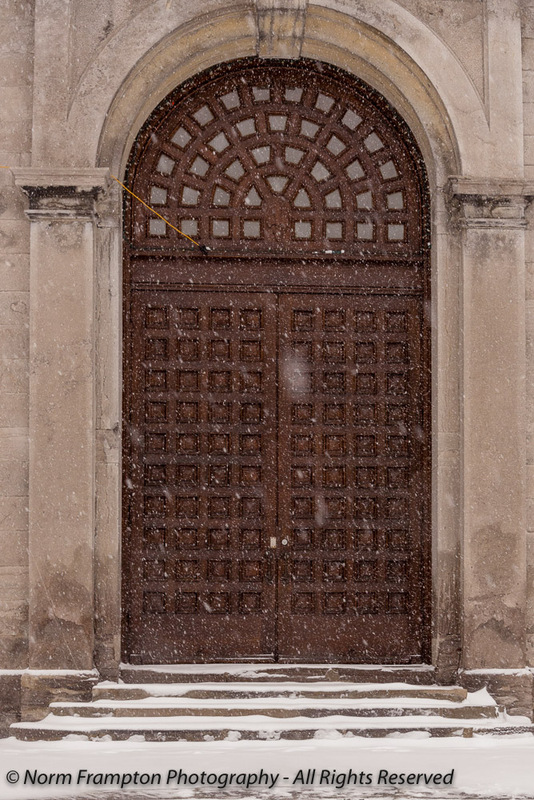 Some really beautiful and grand doors on the church…and of course the snow! Thanks. We’ve had rain here this week so the snow is gradually melting but we still have lots left. Love the church, especially with the snow.